Email Scheduler from RGB Technologies provides easy, intuitive email scheduling, integrated within your existing Salesforce® account. 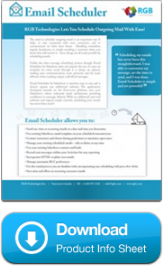 Perfect for individual or batch emails, one-time scheduling or recurring transmissions, Email Scheduler is the simple solution to your email scheduling needs. Don’t settle for clunky, external third-party schedulers when you can utilize an integrated system, native to Salesforce, to handle your scheduling needs with ease. • Save time and effort, while ensuring on-time delivery! Sign up for the Email Scheduler Free Trial on the AppExchange.